*Requires Qualifying competitive trade-in Product. Click here for details. Email is crucial for your business communication, but it can also expose your business to sabotage and productivity drains if email-based threats such as ransomware, phishing, business email compromise (BEC), spoofing, spam and viruses flood your mail servers and user inboxes. What’s more, government regulations now hold your business accountable for protecting confidential data and ensuring it is not leaked and that email containing sensitive customer data or confidential information is securely exchanged. Whether your organization is a growing small-to medium-sized business (SMB), a large, distributed enterprise or a managed service provider (MSP), you need a cost-effective way to deploy email security and encryption, and the scalability to easily grow capacity for - and delegate management across - organizational units and domains. SonicWALL Email Security appliances and software provide superior protection from inbound and outbound email threats and compliance violations by scanning all inbound and outbound email content and attachments for sensitive data, delivering real-time protection ransomware, advanced phishing attacks, spoofing, viruses, malicious URLs, zombies, directory harvest (DHA), Denial of Service (DoS) and other attacks. The solution leverages multiple, patented SonicWALL threat detection techniques and a unique, worldwide attack identification and monitoring network. SonicWALL Email Security now integrates with the Capture Advance Threat Protection service, to deliver fine-grained and user-transparent inspection of SMTPbased traffic. The cloud-based Capture ATP service can scan a broad range of email attachment types, analyze them in a multi-engine sandbox, and block dangerous files or emails before they reach your network. Email Security with Capture ATP gives you a highly effective and responsive defense against ransomware and zero-day attacks. The solution also includes Domain-based Message Authentication, DKIM (Domain Keys Identified Mail), SPF (Sender Policy Framework), Reporting and Conformance (DMARC), a powerful email authentication method that helps identify spoofed mail, reducing spam and advanced phishing attacks such as spear-phishing, whaling, CEO fraud and business email compromise, It also reports on sources and senders of email, so you can identify and shut down unauthorised senders falsifying email with your address and protect your brand. In addition, it prevents confidential data leaks and regulatory violations with advanced compliance scanning and management, including integrated email encryption cloud service to ensure secure exchange of sensitive data. Administration of the Email Security solution is intuitive, quick and simple. You can safely delegate spam management to end users, while still retaining ultimate control over security enforcement. You can also easily manage user and group accounts with seamless multi-LDAP synchronization. For large, distributed environments, multi-tenancy support lets you delegate sub-administrators to manage settings at multiple organizational units (such as enterprise divisions or MSP customers) within a single Email Security deployment. Detect and block advanced threats until verdict. This service is the only advancedthreat-detection offering that combines multi-layer sandboxing, including full system emulation and virtualization techniques, to analyze suspicious code behavior within emails, to protect customers against the increasing dangers of zero-day threats. And, the Email Security Capture now delivers finer granularity with more extensive file-type inspection, additional in-depth reporting capabilities, and a more streamlined and less obtrusive user-experience. Stop spam, phishing, spoofing, zombie and virus attacks using multiple proven, patented1 techniques including reputation checks that check not only a message’s sender IP reputation, but also the reputation of its content, structure, links, images and attachments. Email Security protects against DHA and DoS attacks, and ensures sender validation. Advanced analysis techniques include a Support Vector Machine (SVM) algorithm, adversarial Bayesian filtering, image analysis and gibberish detection to uncover hidden known threats, and new threats. Receive the most accurate and up-to-date protection against new spam attacks while ensuring delivery of benign email with real-time threat information from the SonicWALL Global Response Intelligent Defense (GRID) network, which collects information from millions of data sources. The SonicWALL threat team analyzes that information and performs rigorous testing to establish reputation scores for senders and content, identifying new threats in real-time. Get up-to-date anti-virus and antispyware protection with SonicWALL GRID Anti-Virus. Also add Cyren, Kaspersky and McAfee anti-virus signatures and malicious URL detection for multilayer protection that is superior to that provided by solutions that rely on a single anti-virus technology. Moreover, you can safeguard your network from the time a new virus outbreak occurs until the time an anti-virus signature update is available by adding the predictive technology of SonicWALL Time Zero Virus Protection. Simplify management with intelligent automation, task delegation and robust reporting. Automatically manage email addresses, accounts and user groups. Seamlessly integrate with multiple-LDAP servers. Confidently delegate spam management to end users with the downloadable Junk Button for Outlook® plug-in, while still retaining full control. Locate any email in seconds with the Rapid Message Search Engine. Centralized reporting (even in split mode) gives you easily customizable, systemwide and granular information on attack types, solution effectiveness and built-in performance monitoring and reports are available in PDF and JPEG formats. This add-on service enables compliance with regulatory mandates by helping you to identify, monitor and report on email that violates compliance regulations and guidelines (e.g., HIPAA, SOX, GLBA, and PCI-DSS) or corporate data loss guidelines. The subscription service also enables policy-based routing of mail for approval, archiving and encryption. Add a powerful framework for stopping data leaks, managing and enforcing compliance requirements and providing mobile-ready secure email exchange for organizations of all sizes. Encrypted email can be tracked to confirm the time of receipt and time opened. Intuitive for the recipient, a notification email is delivered to the recipient’s inbox with instructions to simply log into a secure portal to read or securely download the email. The service is cloud-based with no additional client software necessary and unlike competitive solutions; the encrypted email may be accessed and read from mobile devices or laptops. Gain scalable, long-term value by configuring your solution for growth and redundancy with minimal upfront costs. You can deploy Email Security as a hardened, high-performance appliance, as software leveraging existing infrastructure or as a virtual appliance leveraging shared computing resources to optimize utilization, ease migration and reduce capital costs. Start with a single system and then as your business grows, add capacity and move to a fail-over enabled, split-mode architecture. Multi-tenancy support allows large enterprise or managed service provider deployments with multiple departments or customers to establish organizational units with one or multiple domains. The deployment may be centrally managed, but still allows a given organizational unit to have its own users, sub-administrators, policy rules, junk boxes and more. 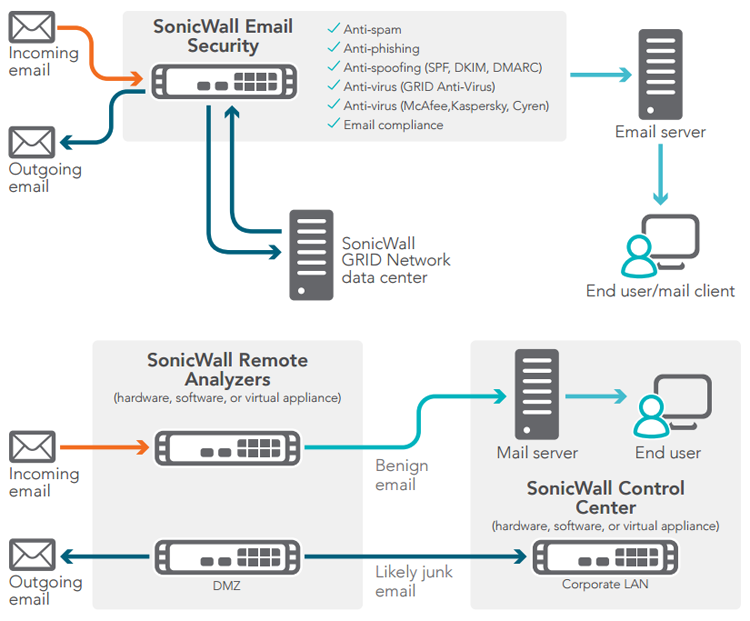 The highly flexible architecture of SonicWALL Email Security enables deployments in organizations that require a highly scalable, redundant and distributed email protection solution that can be centrally managed. SonicWALL Email Security can be deployed in either all-in-one (Figure 1) or split mode (Figure 2). In split mode, systems may be configured as a remote analyzer or a control center. In a typical split-mode setup, one or more remote analyzers is connected to a control center. The remote analyzer receives email from one or more domains and applies connection management, email filtering (anti-spam, anti-phishing and anti-virus) and advanced policy techniques to deliver benign email to the downstream email server. The control center centrally manages all remote analyzers and collects and stores junk email from the remote analyzers. Centralized management includes reporting and monitoring of all related systems. This paradigm allows the solution to costeffectively scale and protect both inbound and outbound email for growing organizations. 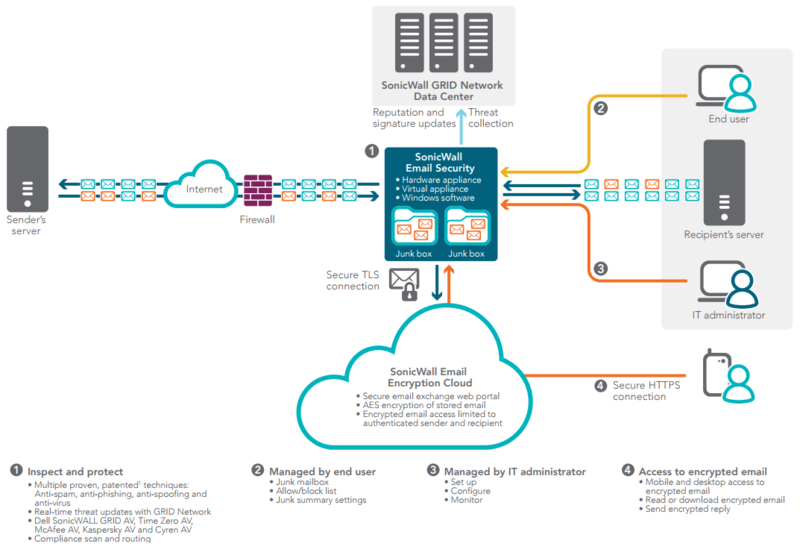 Using SonicWALL Email Security Virtual Appliances, split mode can be fully deployed on one or multiple servers for optimal efficiencies of scale. All-in-one configuration (Figure 1) In an all-in-one configuration, filtering and management take place on the same system. High availability deployment (Figure 2) For load balancing and redundancy, split mode enables organizations to filter at the network perimeter while providing centralized control. Administrators can easily synchronize SonicWALL Email Security across multiple LDAP servers in distributed and hosted environments for scalable deployment. Protect against emerging zero-day attacks and prevent sensitive data from leaving your organization. Get clear visibility into your SMTP traffic, with detailed reporting to help you better manage your email communications. SonicWALL Email Security now integrates with our Capture Advance Threat Protection (ATP) service, to deliver fine-grained and user-transparent inspection of SMTP-based traffic. This cloud-based sandboxing technology enables you to scan a broad range of email attachment types to detect advanced threats, analyze them in a multi-engine sandbox, block them prior to a security verdict, and rapidly deploy remediation signatures. With multiple administrative options ranging from removing the offending attachment to blocking the entire message, Email Security with Capture ATP delivers higher security effectiveness, faster response times and a lower total cost of ownership for industry-leading email sandboxing security. Add optional multi-layer anti-virus protection, including McAfee Signature updates, SonicWall Time-Zero virus protection and zombie detection. Promote compliance with internal and industry mandates, using compliance dictionaries, attachment scanning, approval boxes, record ID matching, archiving, encryption and compliance reports. Prevent confidential data leaks and regulatory violations with advanced compliance scanning and management, including integrated email encryption cloud service to ensure secure exchange of sensitive data. Configure policies to scan outbound email content and attachments for sensitive data. When detected, the email is encrypted for secure email exchange with customers and partners. Encrypted email can be tracked to confirm the time of receipt and time opened. Intuitive for the recipient, a notification email is delivered to the recipient's inbox with instructions to simply log into a secure portal to read or securely download the email. The service is cloud-based with no additional client software necessary and unlike competitive solutions; the encrypted email may be accessed and read from mobile devices or laptops. Ensure greater return on investment and long-term value with a subscription bundle including SonicWALL Email Protection subscription with 24x7 Dynamic Support, Email Compliance subscription, and multi-layer anti-virus protection, including McAfee, Kaspersky and Cyren signature updates, plus SonicWALL Time-Zero virus protection and zombie detection. This renewable subscription only needs to be ordered for a SonicWALL Email Security Appliance that is set-up as a "Remote Analyzer." This subscription allows the covered SonicWALL Appliance system to obtain hardware maintenance support coverage from SonicWALL including RMA services as appropriate. Failure to have such coverage will mean that the uncovered SonicWALL Appliance which is being used as a "Remote Analyzer" will have NO hardware maintenance coverage and will not be afforded RMA services. Additional Email Encryption Service Subscriptions are available, click here!